Our little miss Lulu is 5 months old. Which means our days are numbered before we have a crawling kiddo in our house, trying to get into everything. So, the baby proofing begins. My first challenge I need to conquer is our wine. We've managed to build up quite a collection since between being pregnant and breast feeding I haven't been drinking much of it for over a year. We had a wine rack that sat on the ground - and now obviously those bottles need to be raised out of reach of baby. 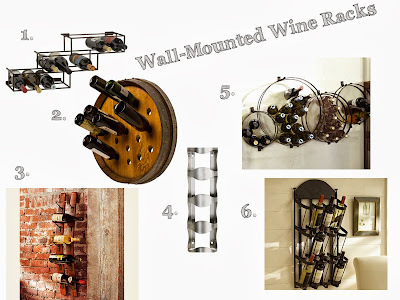 So I've been on the search and have found some options for wall mounted wine racks that I thought I'd share. I really like the Round Wine Barrel Wine Rack - but its a bit on the expensive side. Obviously, the Ikea one is the best deal - but the metal doesn't exactly match our house. The Pottery Barn Circles one is on sale - but I'm worried its too large. Anyone else have any wall mounted wine rack suggestions?